The Little House of Concrete Bookshelves: Colin Cotterill "Slash and Burn"
Having finished the eighth title in Colin Cotterill’s Dr Siri series, one can’t help feeling the Slash and Burn in the title is reflected in an authorial desire to move on to fresh ground, in much the same way as practitioners of shifting agriculture are forced to when their current patch starts to run out of nutritional steam. 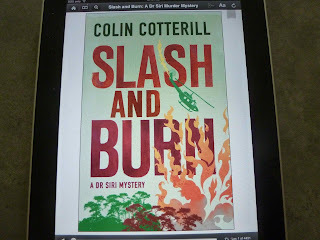 Having noted the existence of a new Cotterill series (Jimm Juree as the protagonist, two titles, Killed At The Whim Of A Hat and Granddad, There's a Head on the Beach to date) and the near death experience in Siri #7 (Love Songs From a Shallow Grave) it seemed safe to assume that we’d reached the end of the road as far at the National Coroner of the People’s Republic of Laos was concerned, but here we are with an eighth title and the possibility of intermittent episodes to come, a possibility that came to pass with the appearance of The Woman Who Wouldn’t Die at the start of this year. Cotterill had, in other words wound things up, but left the way open for a sequel since, while Dr Siri Paiboun is looking down the barrel of a ninth decade (he’s pushing eighty, and is still, however reluctantly in the work force) and might be on the verge of actually retiring, there’s always the possibility his services might be needed (purely on an ad hoc basis, you understand) in the future. This time around, with the paperwork relating to actual retirement lodged and apparently accepted, Dr Siri might be looking forward to retirement, coffee mornings overlooking the Mekhong, leisurely noodle lunches at his wife Daeng’s shop, long evenings of talking rice whisky nonsense with ex-politburo man Civilai, and nights stretched out against a triangular pillow in his illicit back room library reading French literature and philosophy, but he’s asked to undertake one last assignment. In 1968 Capt. Boyd Bowry, son of a U.S. senator, went Missing In Action, presumed dead after the helicopter he was piloting exploded over a remote jungle village in northern Laos. With the American involvement in Indochina over, they’ve turned their attention to the servicemen registered as MIA, and given Bowry’s parentage, his disappearance is going to be given a higher priority than might otherwise be the case. Having appointed Dr. Siri’s nemesis Judge Haeng to head the Lao contingent in the investigation, you and I might suspect Siri is the last person Haeng would want included in the excursion, but the Americans know there’s a National Coroner and have asked for him by name. Seizing the opportunity, Dr Siri engages in a bit of coercion (well, blackmail really) to have his wife and his regular crowd of cronies included in what looks to be a preretirement junket, which is how he manages to get Nurse Dtui and Mr. Geung, Dtui’s husband Inspector Phosy, ex-Politburo member Civilai and transvestite/fortune-teller Auntie Bpoo in on the action, joining a number of colourful Americans including the pompous US senator complete with white suit who’s there for the photo opportunity when they find the body, a a loudmouthed heavy-drinking ex-serviceman with a dodgy past. Since Siri speaks little English he’ll need an interpreter, which explains Auntie Bpoo, and since American need one of their own we get a highly attractive girl named Peach, born in Laos to an American missionary couple, a Lao heart “forced to live in this big awkward farang body” (her words) with a sense of humour and looks guaranteed to break vast numbers of hearts with Judge Haeng being an obvious starter in that department. They’re off to the Friendship Hotel, a remote location on the Plain of Jars, with the Americans supplying transportation and prepackaged meals, and the location, a decrepit building in the middle of a field of unexploded ordinance raises issues involving the carpet bombing of Laos during the Vietnam war era. That’s only a starting point, however. Other issues that turn out to have some bearing on the case include covert American operations during the seventies, the discovery of gold around the same time, and the legacy the war has left on the landscape, in the villages of Laos and on the minds of the citizens, who are out for whatever they can wangle out of the MIA caper. 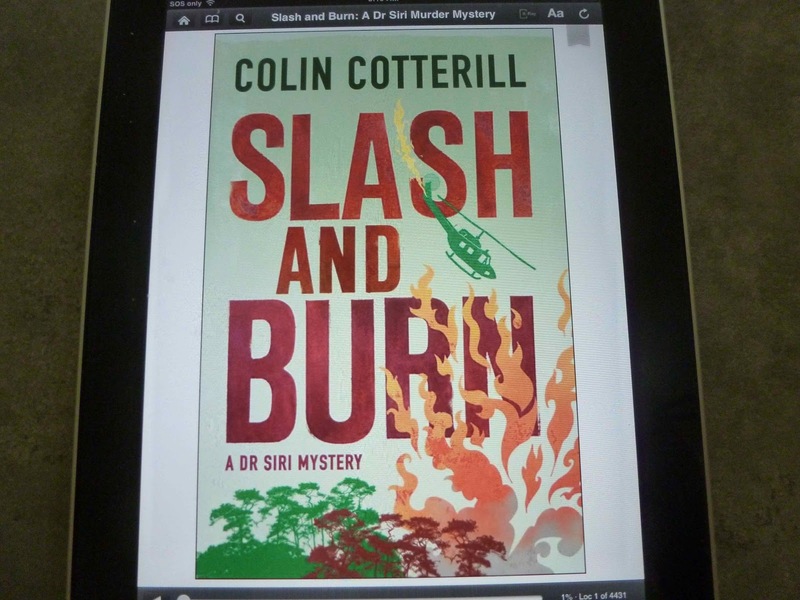 One of Dr Siri’s first tasks is to find a way to cut down on the vast number of false claims by his opportunistic compatriots who claim to have material that might be connected to a MIA case and are only too happy to sell. Once that’s out of the way a couple of complications set in. First up, cross-dressing fortune-teller Auntie Bpoo advises Dr Siri that his days are numbered and the count is down to the fingers of one hand. Then, a member of the party is found dead, which begins a train of events that don’t seem to be entirely accidental. Smoke from local fires obscures the countryside, which would be fine a few months further down the track, when it would probably be the smoke from locals practising slash and burn agriculture and clearing new patches of ground to farm, but they don’t do that sort of thing at this time of year. Dr. Siri is sure something is going on, and the poor visibility is probably a deliberate smoke screen. Communications with the outside world go down, the group is forced to stay to the point where the prepackaged rations run out, Madame Daeng takes over the catering and as everyone pursues their own agendas mysterious events in the Philippines suggest things are even more complicated than they seem. Predictably, Siri eventually makes sense of the situation, announces what happened to the pilot and unmasks the murderer within the group, which is, ironically, not the actual point of the story or the series from where I’m sitting. The whole series is increasingly looking like an opportunity for Cotterill to engage in a little sardonic comment through his Laotian mouthpiece on the horrors inflicted on a small country that would have been quite happy to mind its own business but has been forced to suffer as the major powers manipulate events within and outside its borders in the nominal cause of a fight for freedom.